We have 2, 3, and 4 bedroom Villas and homes, all with swimming pools. References are provided upon request. These homes are the best. The 2 bedroom units sleep up to 6, the 3 bedroom units sleep up to 8 and the 4 bedroom units sleep up to 10. The 2 and 3 bedroom units have 2 baths, the 4 bedroom units have 3 baths. All kitchens are fully equipped. The 4 bedroom units have a separate dining room and family room. The 2 and 3 bedroom Villas have outside parking. The 4 bedroom units are located on a lake which has a park with children's swings and slides. Pets are allowed in some units, there is a spray charge. 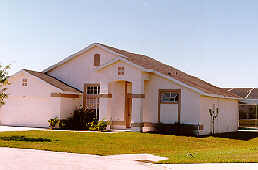 Rates are between $550.00 and $1200.00 per 7 night week plus tax in US currency.